Do you have a problem with rabbits on your land? Contact Norfolk Pest Control Services on 01379 852 950 or 07806 875 985. 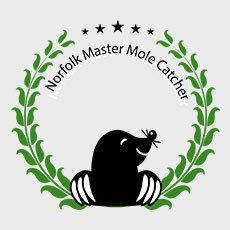 Norfolk Pest Control Services can take care of your moles for you. Whether you have just the one, or many call 01379 852 950. Are deer causing damage to your land? We are qualified and insured, to work on both small and large contracts. Hello, I’m Mark Cotton and I’ve worked in pest control for 36 years. The management of Norfolk’s pests and wildlife has been our family business for generations. There is no VAT on our prices, so call us today to discuss your pest control issue and we’ll offer you a safe and cost-effective solution to your problem. Norfolk Pest Control Services are certified and trained by the British Pest Control Association and Wildlife Management Association. We are also CRB checked and a member of UK Pest Controllers. For us, it's not just important that you know we're qualified, we also believe that it's important that you feel comfortable in your property, that's why we are CRB checked and a member of UK Pest Controllers. We undertake large and small contracts with a range of clients including: farmers, landowners, domestic clients, golf and sports clubs, homeowners and local authorities. Norfolk Pest Control Services guarantee you’ll be both pleased with our service and that your pest problem will be eradicated quickly and without breaking the bank.